✅ SUPER-BRIGHT LIGHT TO KEEP YOU SAFER: ThorFire bike lights use high quality LED with 350 lumens ultra brightness, the brightness range is over 164 feet, makes your night riding safer and confident. The bike light LED has 7 lighting modes: High/Mid/Low/Power-saving/50% Flashing/100% Flashing/Strobe, meeting all lighting requirements for riding. Best light for bike. ✅ LONG BATTERY LIFE USB BIKE LIGHT: Hassle free on replace batteries, ThorFire bicycle headlight is USB rechargeable. It charges from your computer or any device with a USB port. After charging for ONLY 2 hours, the LED bicycle light will last up to 8 hours on low, 4.2 hours on medium, 3 hours on high brightness. perfect for riding enthusiasts. ✅ RAINPROOF & DURABLE: Water-resistant, weather tight design ensures all conditions use. The charging USB port is protected by a lid from water and dust. This bike front light is aluminum alloy and ABS plastic combination design which avoids the headlight overheating after long time usage. 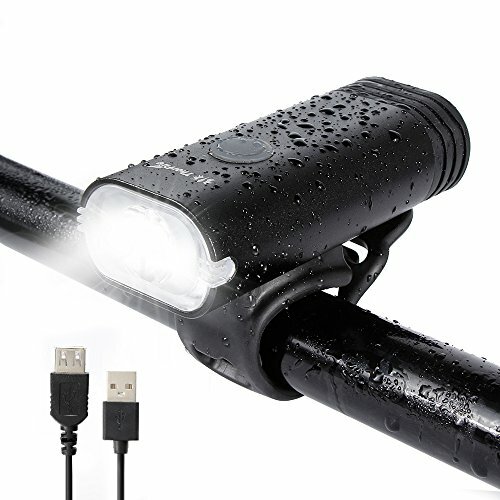 Very durable use bike flashlights. ✅ EASY INSTALLATION & QUICK RELEASE: It's very easy to install the bike headlight with no tools and the light secure fits for all kinds of bikes. The led bike light is quick releasable, very convenient to take with when locking bikes outside. It also can be used as a flashlight for an emergency, so convenient! ✅ 100% SATISFACTION GUARANTEE - Every light from ThorFire comes with 40 days money back guarantee, ONE-YEAR HASSLE-FREE WARRANTY and friendly customer service.